City Hall. Park at Smart Park at 4th near Taylor. You’ll only be in there for 40 minutes if you come at 9am. Michael Steele in PDX! I’ll Be There Too! Obama: Bush was a Socialist, but not Him. Finally, a good law proposed that we all should support. Oregon Representatives have proposed House Bill 3008 which should help defray the cost of lost revenues and help maintain roadways throughout Portland. Not all Portlanders are pleased though, as what some call a majority in the city will be responsbile for the $54 payment every two years. Those opposed argue that HB 3008 is just a way for police to keep tabs on them and they should not have to pay to traverse throughout Portland. 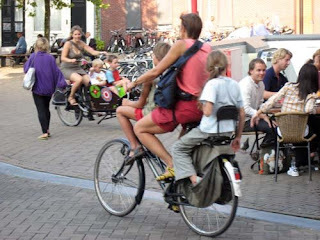 This bicycling “majority” has no problem calling for and seeing others paying increased fees, taxes and what have you, but when it comes their turn, they balk. Hey cyclists, where’s your “bi-partisan” spirit? Where’s your pride in maintaining Portland beautiful and accessible? You want not only “equal access” to the roads, you want sole access in Portland, but don’t think you should share in the cost? of Moody’s Economy.com, says the recently enacted $787 billion stimulus package will fall far short of the Obama administration’s goal of saving or creating 3.5-million jobs. 4. Opposed to American values. 6. What did I miss? Oh, yeah, look here at La Raza and MeChA’s adherents. 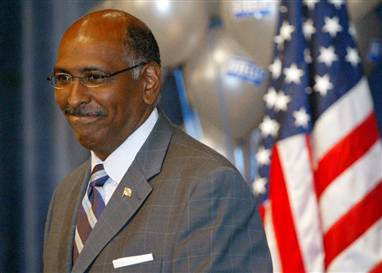 I’ll ask Michael Steele, the real head of the RNC, what he supposes the D’s have in store for him when he’s in town on Thursday. Maybe more Oreos? That’s Why We Call it "Crime Met!" Tri Met Hires Ex (?) Gangsters to Patrol MAX. TriMet’s solution to criminal activity by gangsters on MAX is to hire former professional thugs here. Of course Tri Met is paying for the former gang members to ride. Victory Outreach is a wonderful organization dedicated to changing lives for God (here) and I’m all about it, but I wonder if more uniformed officers would be better. After all, as pointed out here yesterday, TriMet is getting all KINDS of–what did they call it? 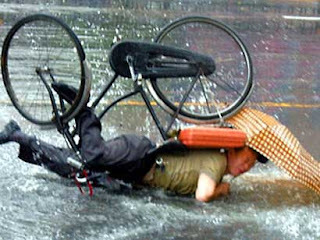 –Oh, yes, “stimulus” money to build bicycle garages at a cost of $5145 for each bicycle. That bike tax (here) is looking good right about now. support of customer services, safety and security, as well as providing a physical presence on the transit system to serve as a deterrent for inappropriate, intimidating and illegal conduct related to gang activity. This is similar to work being done by the Rider Advocates in North and Northeast Portland neighborhoods. patrol Max for only the cost of a ticket? Story here. 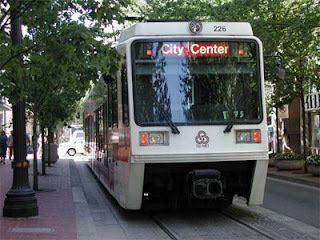 Administration data for 2004 indicate that, per passenger mile, light rail is involved with more than 3 times as many aggravated assaults, 26 times as many burgleries, 7 times as many rapes, and 10 times as many robberies as buses. The numbers for 2002 and 2003 are similar. The Oregon Catalyst has a history of crime on light rail here. If you don’t believe them, see for yourself here. See why they call it “Crime Met” (thank you 5th Listener!) by looking at the crime map here.